Snowdrift Art Space, Flagstaff Nuestras Raíces, and the Winslow Chamber of Commerce presented Winslow’s Día de los Muertos (Day of the Dead) Celebration on Saturday, November 2, at Snowdrift. Día de los Muertos is celebrated throughout Latin America and the Southwestern United States from October 31 through November 2, when families remember their departed ancestors and loved ones by placing ofrendas (offerings) at graves and altars. Members of the public set up their own individual shrines at Snowdrift, and visitors were also encouraged to add ofrendas to the Community Shrine. Nuestras Raíces hosted a Sugar Skull Workshop at 2 pm, and visitors also decorated skull masks and made paper flowers. 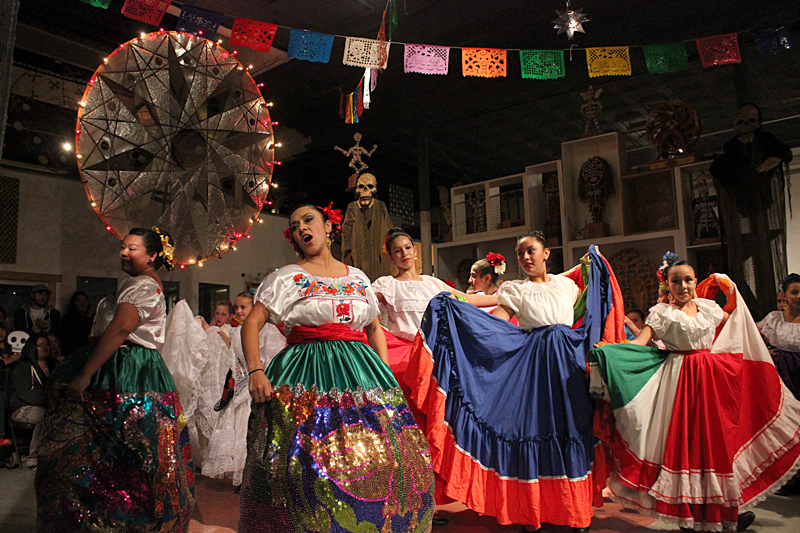 Local composer Richard Haymes performed an original composition on the harmonium, and the Northland Pioneer College Folklorico Dancers also performed. The event concluded with a traditional Día de los Muertos procession from Snowdrift to the Hubbell/Winslow Visitors Center along the First Street Pathway.